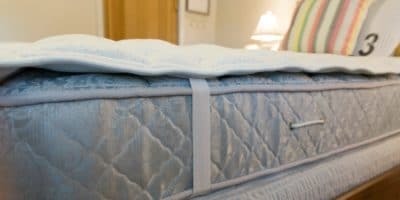 Having a mattress topper in college is just as important as having a reliable computer, all-season clothes, and a big backpack. Unfortunately, a lot of first-time students fail to put one of their packing lists, and they struggle to sleep as a result. Bringing one is important but just as important is bringing the best one. The right option helps to ensure hours of deep sleep. The wrong one is just a costly piece of clutter. As the packing and preparation ramps up, learn which option wins in DormCo.com vs. Dorm Topper. Both DormCo.com products and DormTopper make use of gel-infused memory foam to provide a comfortable and supportive sleep surface. That’s a big upgrade over the average dorm mattress which is usually lumpy, saggy, or stiff. But Beloit’s Dorm Topper does not use gel-infused memory foam alone. It also features pure New Zealand Joma wool to help regular climate and wick away moisture. Plus, sustainable bamboo knit fabric is stitched between the memory foam and the sleeper and offers a silk-like sleeping surface. Instead of being simply a piece of foam, it’s like a complete micro mattress. Dorms are dirty places, and a lot of germs end up settling on the bed. Once they’re in the bed, they end up on the skin and eventually lead to colds, the flu, and worse. The DormCo.com mattress toppers are made of hypoallergenic materials, but that’s all. DormTopper is also hypoallergenic, but it fights off more germs by being mold resistant, naturally antibacterial, moisture absorbent, sustainably sourced, and even odor fighting. Everywhere else in the dorm may be filthy, but the bed stays clean. DormCo.com is a company that sells a wide range of dorm products, from mattress toppers to storage solutions to wall art. That means their expertise is more related to interior design than sleep solutions. The DormTopper from Beloit Mattress Company, by contrast, has been designed, made, and inspected by true mattress masters with generations of experience helping people sleep better for longer. Beloit’s DormTopper is uniquely able to serve the sleep needs of college students, and thanks to quality materials, hand stitching, and a focused production process, these mattress toppers work great through four years of college and beyond. College is one of the most exciting and important experiences in a young person’s life. Why spend it struggling to sleep at night and then struggling to focus during the day? With DormTopper, you are sure to have plenty of energy for both early mornings and late nights. Download our FREE ebook, From Zs to As, to learn more about mattress must and the importance of quality sleep while away at college.